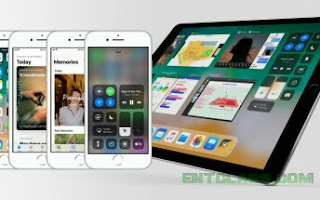 Apple has released another version of its iOS 11 update that was officially announced few weeks ago. The update is just a second minor update to iOS 11. The latest version now is iOS 11.0.2. This new update is all about bugs fixes, and it's now rolled out to both iPhone and iPad devices. It's highly recommend that you update your iOS device to 11.0.2 as quickly as possible. 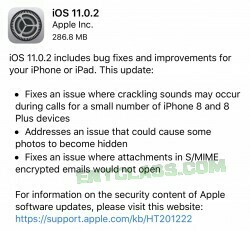 That's especially true if you have an iPhone 8 or iPhone 8 Plus and have had crackling sounds during phone calls, as this release will fix the bug that caused that. Also taken care of is a bug that caused some photos not to show up in your libraries, and an issue relating to attachments in encrypted email has been resolved too. Nice update for ios users. A friend of mine said he prefers iOS due to security. That's a very warped view, there's nothing secure about iOS, it's as vulnerable as windows. Well bugged with CIA back-doors. If security is the reason why you use iOS, you're on a long thing. Keep the good job apple product.